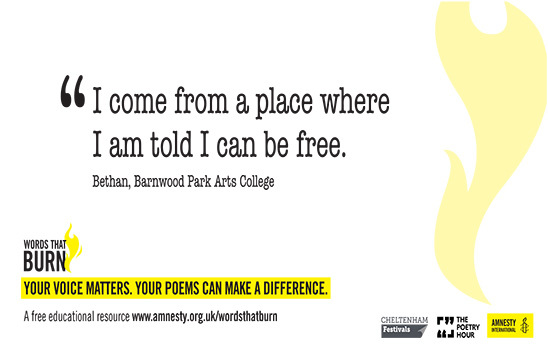 Thank you to Barnwood Park Arts College, Cleeve School, Gloucestershire Hospital Education Service and Severn Vale School for piloting the Words That Burn resource. 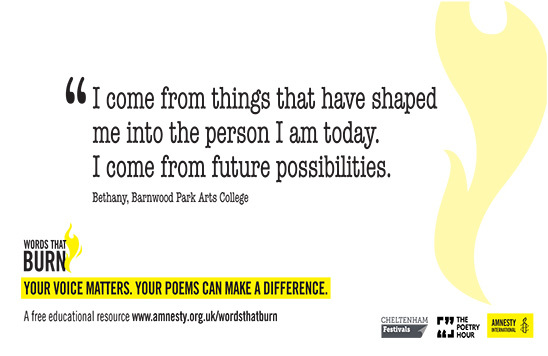 Here students from Barnwood Park Arts College and Cleeve School share their poetry written in response to Dean Atta’s poem I Come From (Burn 2: being me). I come from long days but nights filled with pointless dreams. I come from being raised by a Grampy who’s now suddenly gone. I come from recent self-esteem issues and a loss of love for the sun. I come from watching people struggle to temporarily fix a permanent problem. I come from being unable to stop missing you. I come from being overlooked but also under constant judgement. I come from criticism, a loss of faith in my religion. I come from always failing to make a good decision. I come from always missing that sense of completeness and belonging. I come from early morning practices and infinite laps of the pool. I come from a slim figure with a swimmer’s appetite. I come from awful tan lines from training in the summer. I come from every critique given and every skill mastered. I come from friends who became family when I was not at my peak.